Last summer, through the simple falling of a leaf, I came to fully appreciate the true beauty of how Mother Earth moves through her seasons. Though I have always understood how each season begins with a specific positioning of the sun, I had not been mindful enough to appreciate how exquisitely the Earth sways through the seasonal year--ever cycling; never stagnant. I learned that it’s the tiniest changes in our environment, and our activities therein, that truly “make” the seasons. In my lifestyle and spirituality, I attune myself to Mother Earth and her cycles. Through mindful observation, I have fostered a relationship with the Earth, and deepened my appreciation for my place the dance of life. One of my favorite ways of staying in tune with the shifting world is journaling the changes I see. For the last year, I have documented the little changes in the outside world—the color of leaves, the first flower to bloom. It has been an eye opening and satisfying activity, so I’d like to share it here with you! A Journal: I prefer Moleskin brand journals for their ease of use, durability and longevity, but a spiral bound notebook also works well. On the first page, give your journal a name. I call mine “Seasons: A personal observation”. Number the pages and add a table of contents for each month. A Pencil or pen for scribing your words: I like to use a pen to write with so my words will keep for years to come. I also keep colored pencils nearby for illustrations. A quick walk outside or a window to gaze out: This is a wonderful opportunity to familiarize yourself with the flora and fauna of your neighborhood. Or, grab a cup of tea and curl up in a seat by the window. Look/listen for things you haven’t noticed before. Below are the things I put in our family journal. 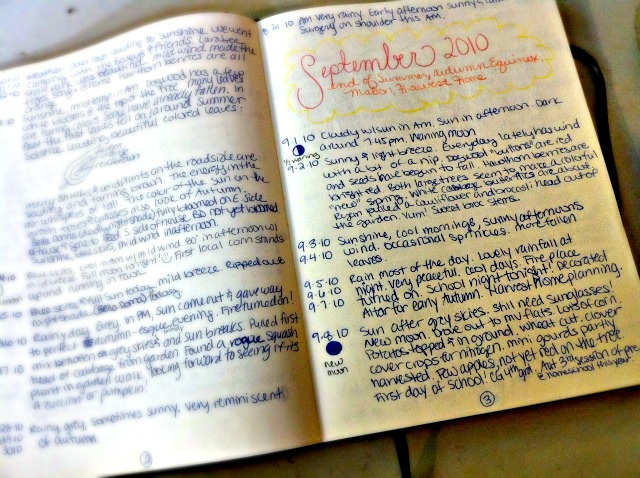 Use these ideas as a guide for your own journaling style. I try to do my note taking in the evening just in case there is a sharp change in weather in the afternoon. In my area of the world, this happens quite often. I live my life by the changes of the moon, so I follow her phases carefully. I document new, halves, and full moons, and how I'm feeling emotionally at those times as well as the mood of the family as a whole. There is a great deal to be learned from the energy of the moon and it's worth taking a look at what she's doing. I also like to take note of what time the sun rises and sets. It’s neat to see a time log of solar change. What is happening outside? What plants do you see? What colors are the leaves? What flowers are blooming? See any bugs? What about the wildlife? I write down anything that seems interesting and different, but I will also take note of things that seem "normal". Holidays, Sabbats (8 neo-pagan religious festivals marking the phases of the changing seasons), and birthdays are always noted as they play a big role in my family’s seasonal lifestyle. The start of school and the loss of teeth are important, too! I've also noted memorable gatherings on occasion. For instance, one extraordinarily cold night in February, three feet of snow fell and we were unexpectedly snowed in at our friend's house for two days. We hunkered down, all six of us, and together enjoyed the beauty and peace of the experience. It was one for the "history books"! Make your journaling a sensual experience! What do you see? Are the leaves changing colors? 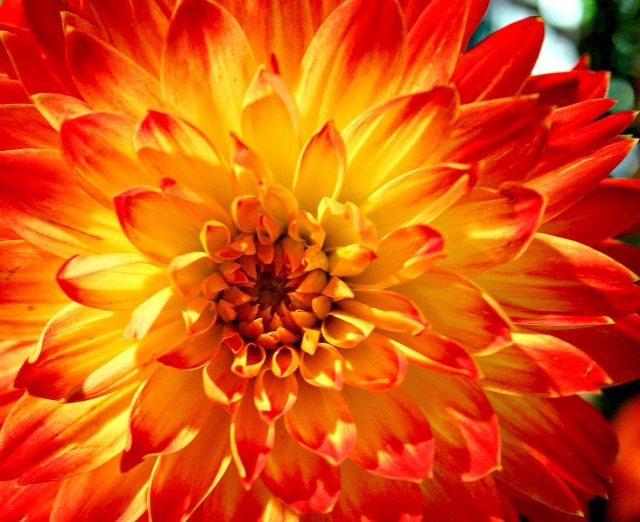 What flowers are in bloom? Any wildlife to be spotted? The 90,000 snow geese that migrate from the arctic tundra to my area each year are a sure sign of winter. What does the air feel like? Any smells wafting through? In the springtime, the sweet scent of tulips, daffodils and tilled earth travel from the farm fields into my town. In the summer, warm nights are delightful. What sounds do you hear around you? The song of the red breasted robin is like the “starting bell” for our spring. What foods are in season in your market store? What favorite foods have you made for your family? For us, strawberries are the true beginning of summer. The first Honeycrisp apple eaten is also the beginning of autumn. I don't dedicate much time at all to writing these few things down, so don’t feel like this activity should be time consuming. Take a few minutes once or twice a week, perhaps on a lazy Sunday, to reflect on the things you noticed that week. Write down what is meaningful to you. Soon you will begin to notice the beauty of the little things and how the seasons blend into each other. Happy journaling!